In a large open clearing covered with a thick layer of leaves and branches in a wooded area on the grounds of an old estate, now Laumeier Sculpture Park, a discovery was made. 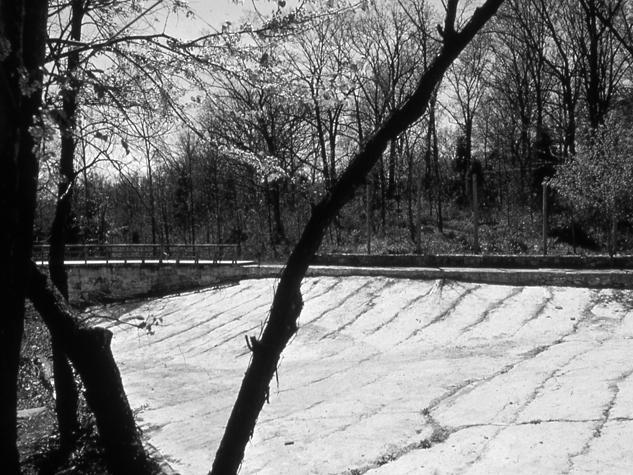 Beneath the debris was the remains of an abandoned swimming area, a large, irregular curvilinear pond-like shape lined with concrete. Around the edge of this area that looked like constructed topography were foundations of buildings, stone walls and remnants of walkways half in the woods, half out. 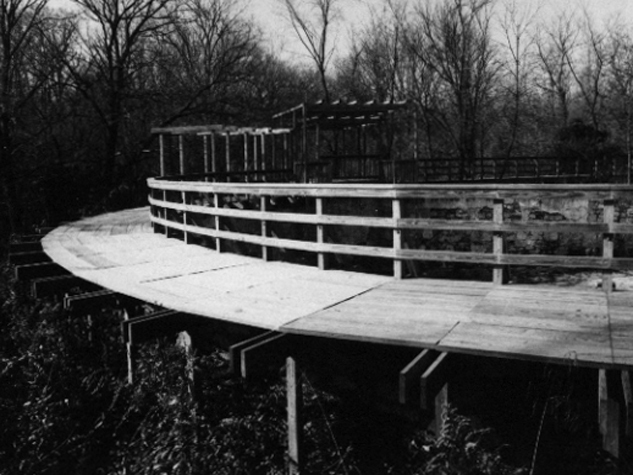 The installation of a series of pavilions and walkways among these existing fragments made use of this ‘found’ site; this was an interest that had evolved over the years, as I continued to use the specific characteristics of a place to develop the work. Unused, abandoned and common engineered elements became the raw material for this project. The work builds upon existing associations, adding another layer of content to what was already there, making a new place to be used. Entrance to the work through a wooden gate-like structure provides a view of a sitting area with a layered wood frame roof. 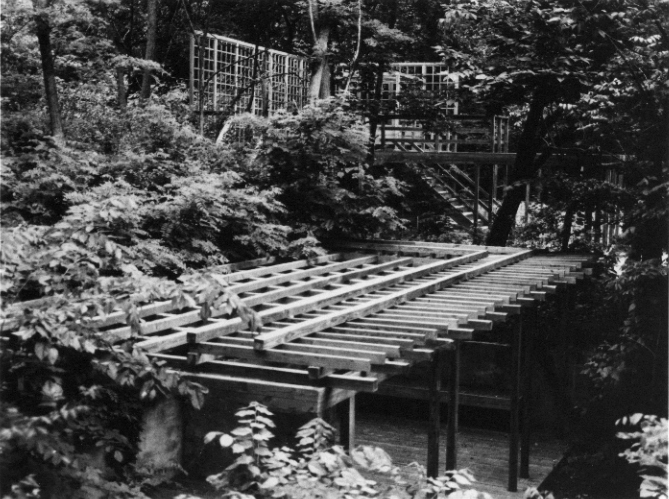 Further on there is a two-story skeletal wood structure that allows climbing, sitting or viewing. Though these are structures which may be occupied, their identity shifts between architecture, place and landscape. 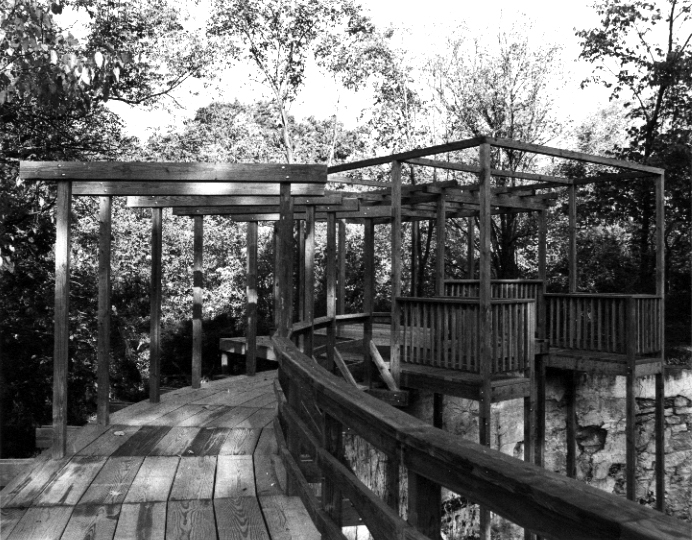 A line of posts leads around to a curved wooden walkway and pavilion at the far end of the complex. All of the walkways and pavilions are located along the edge of the large undulating concrete surface and have it as their focus. It is first seen from one view and then another and another. This open space is appealing in contrast to the dense growth of the woods which come up to its edge. As in other works, the inclusion of referential materials and forms makes primary the role of the viewer’s memory as s/he is the one to make connections between the work and familiar sources. It is a place to spend time. It is not possible to see or understand the project without moving through the whole area – it is revealed piece by piece. 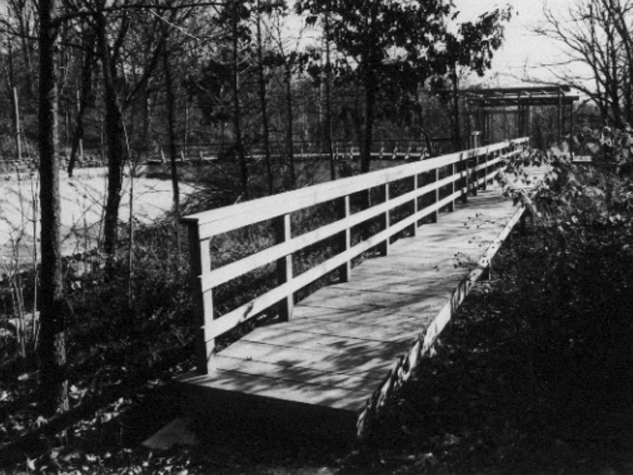 A long straight boardwalk takes you back along the far side of the concrete clearing to where you started. These familiar structures built in a straight forward way reflect images taken from our everyday environment- construction sites, bridges, jungle gyms, garden gazebos. Their incorporation with the existing elements of the place produces new configurations that allow a closer observation of the elements of the surrounding built and natural environments.